Review by AllTheBestFights.com: 2015-11-21, fight not so exciting between Kelvin Gastelum and Neil Magny: it gets two stars (UFC Fight of the Night). The Tuf 17 winner Kelvin Gastelum entered this fight with a professional mma record of 11-1-0 (73% finishing rate) and he is ranked as the No.13 middleweight in the world. He suffered his first loss in January, against Tyron Woodley (by split decision, Woodley vs Gastelum), but then he came back to win against Nate Marquardt (=Gastelum vs Marquardt). His opponent, Neil Magny, has an official record of 16-4-0 (50% finishing rate) and he entered as the No.21 welterweight. He has already fought three times in 2015 beating Hyun Gyu Lim (=Magny vs Lim) and Erick Silva (=Silva vs Magny), but between these two bouts he lost to Demian Maia. 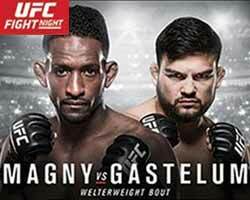 Gastelum vs Magny is the main event of “The Ultimate Fighter Latin America 2 Finale” – UFC Fight Night 78. Watch the video and rate this fight!